Ok, so today I really had to force myself to stick to my original good old plan. At first, I was upset at myself because I thought I was past the point of needing to force myself and reminding myself to stick to my meal plan, because I have so often just listened to my body and eat whatever I want. But like always, I learn again that I can’t plan my recovery. So, today I wasn’t past that point, oh well, I did what I had to do. Moving on. Right before I was about to write this post, I was trying to find an index card for my final tomorrow to make study cards, and I came across my very first journal that E (my therapist gave me). In the very beginning of my recovery, E had me write down my recovery accomplishments every day. I totally forgot about them. As you can see, I am sure we are all grateful this blog is typed and not hand written since my writing is horrible. But it starts on December 28, almost a year ago from today, and it said I ate frozen yogurt and chocolate. 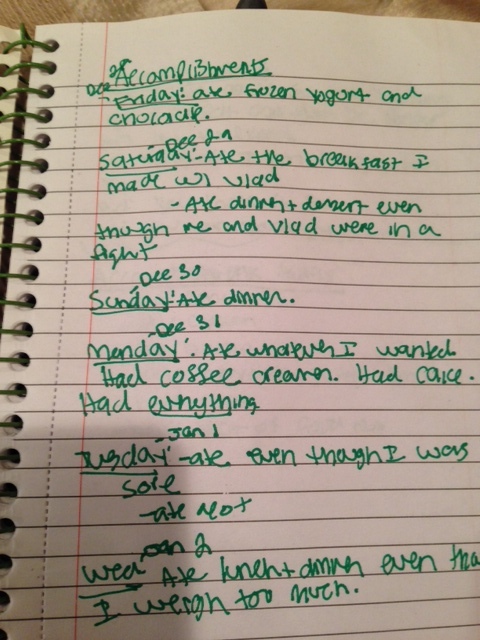 The next day, December 29,it said I ate dinner even though I was in a fight with my boyfriend at the time. The list goes on over the next few days to include eating dinner, one time eating cake and coffee creamer and one time eating even though I thought I weighed too much. (Keep in mind, this was on January 2, I gave up my scale January 21). Looking at that list made me realize that even though it’s been almost a year since I wrote it, those accomplishments still need to be celebrated. So what if I had to force myself to stick to the plan today? I still did it, and that’s an accomplishment. My favorite part about that original list of accomplishments is that every day it said I had some kind of sweets. For those who read this blog every day, you know how much I love sweets. I am so happy that I am here a year later and still able to say I am still eating sweets-and may I use today as a reminder to not forget what an accomplishment that is. To all of our accomplishments today, wether it be big or small, or with food or with our mentality, we deserve to own them, recognize them and celebrate them. Now that I think of it, what does the word accomplishment even mean? If you asked me this on a whim during the day, right now in my life, I would tell you it means that I am graduating college tomorrow and that If I only had a job, then I would be accomplished. But seeing this list shows me how far from the truth that is. Since when does accomplishments have to be a job? Or money? Or not having to work so hard to follow the meal plan? Since when does the word accomplishment even have a certain level of expectation that I need to reach in order to celebrate it? I don’t like it and I want to change that. No more rules and expectations to what I need to do to feel accomplished. My list that I made a year ago had no expectations from E when I made it. She just wanted me to find a reason to feel proud of myself every day. So let’s redefine accomplishment to exactly that: finding a reason to be proud of ourselves every day; even if all we did that day was wake up and simply exist in the moment. And even if all we did, like me today, was follow our meal plan. May I add, I found out today that this blog made it onto NEDA’s 2014 Blogroll. Our journey, our stories, and our support for one another made that possible-and if anything, that’s the biggest accomplishment of all.